TimeTrak is an adaptable job management solution that enables you to customise how your reports and forms look to match how you do business. TimeTrak provides the ability to create custom compliance forms and checklists to suit the environment you operate in. Allowing you to build a catalogue of document templates, they can be easily retrieved and completed on site or in office 24/7. 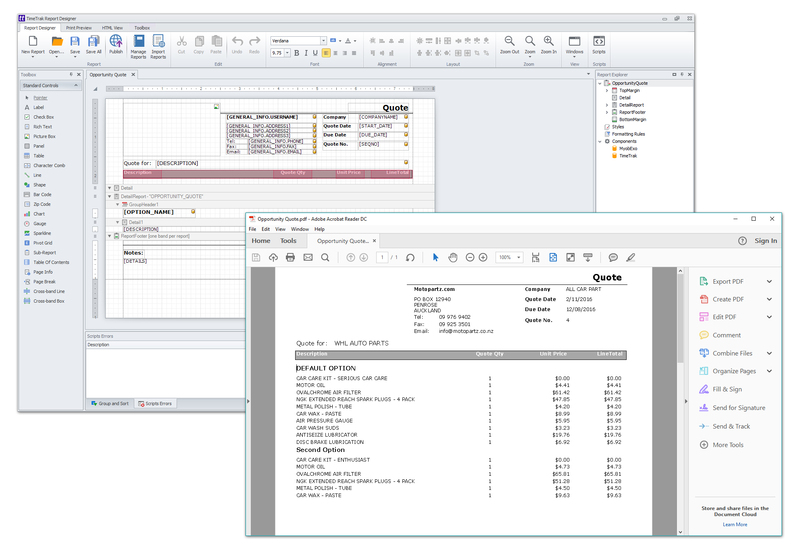 Adapt your reports, forms and invoices to how you want them to be presented. With TimeTrak, you can use our easy-to-use report writer tool to design, add or remove fields, insert logos or images plus much more to ensure what you are sending out to your clients or prospects matches the rest of your business. Keep track of staff, jobs or assets with TimeTrak's reporting tools. Out of the box, TimeTrak offers reporting from both the job perspective, plus who is working on the job and when and what materials are assigned to the job. This gives users visibility of the profiablity of a job. Many job based reports show both your ERP transactional information as well as TimeTrak information not yet posted to your job costing software. Reporting also shows information about the staff, how productive they are and what work they are billing.